Normandy Life: Mosaic Monday # 14 - fête de la pomme au village de Trévières. Mosaic Monday # 14 - fête de la pomme au village de Trévières. 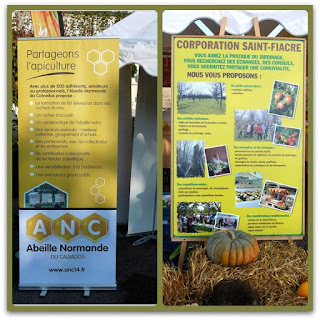 Yesterday we stopped for a while in the village of Trévières to take a look around the Festival of Apples which is held annually on the last Sunday of October. 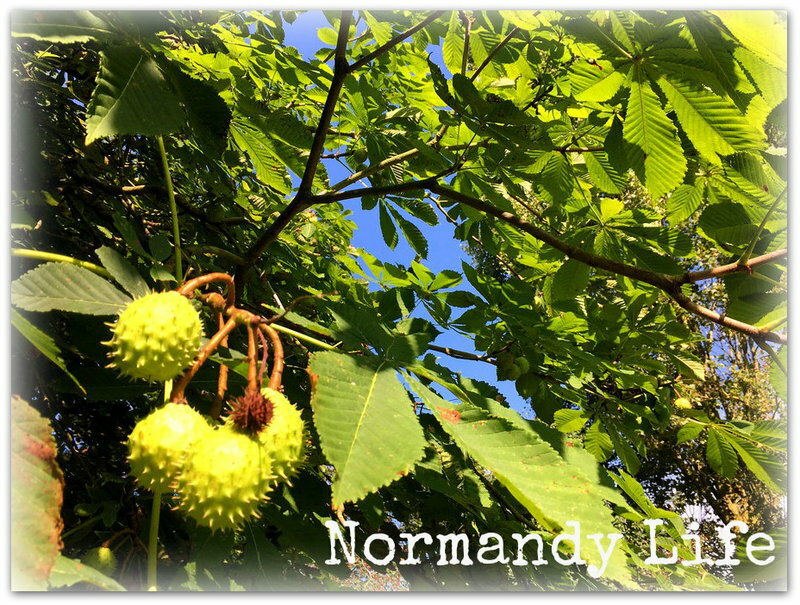 Orchards abound in the Calvados region of Normandy producing wonderful apples which are turned into thirst quenching apple juice and cider, pommeau (aperitif) and apple brandy which takes its name, Calvados, from the region. The Festival is a great chance for local growers to get together to talk about crops and show off their produce. The competition is taken very seriously and standards are high as you can see from these items on display in the judging tent. Volunteers are on hand to help and give advice, they'll sign you up for bee keeping and horticulture too. Seasonal displays of traditional pumpkins and strange looking gourds had been placed around the market place. There were plenty of individual stalls selling delicious regional products and I happily wandered around the market place taking pictures of all the activity. 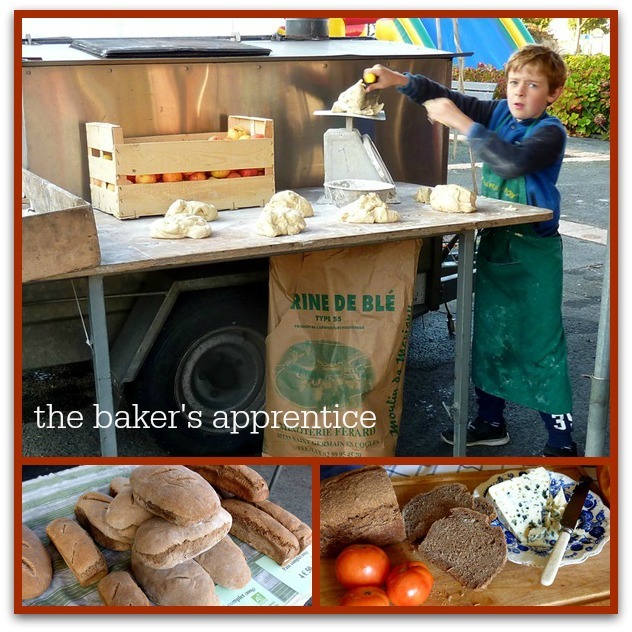 This young lad is following in his father's and grandfather's footsteps, Master Boulanger! 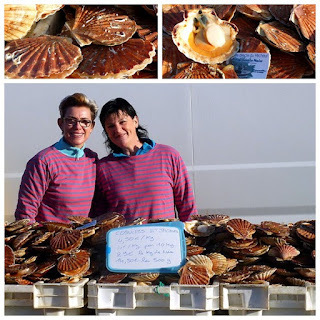 I bought a loaf for us to enjoy with some Roquefort cheese and home grown tomatoes for lunch but although they did look wonderful we declined to purchase some fresh scallops despite the excellent sales pitch from the vendeuses. 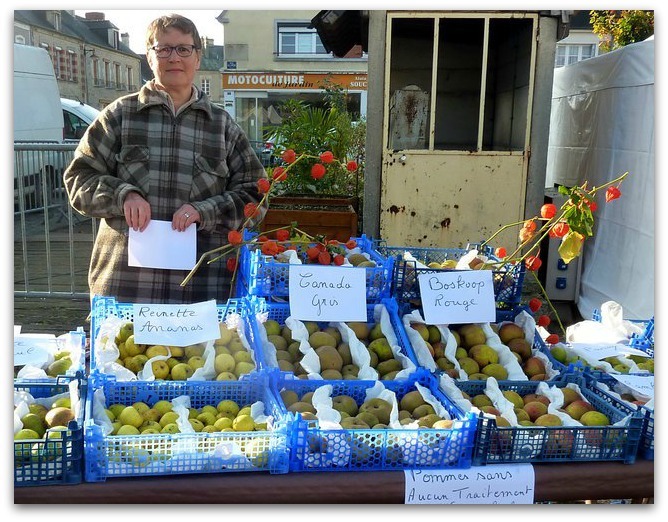 As I made my way across the road, to meet up with the Senior Partner who had taken himself off to find an apple tart for tea, I spotted this lady selling apples and pears from her private orchard. Thanks for hosting, Maggie. Happy Halloween to all! it is 11 p.m. here, we had a lovely dinner and I never eat at bedtime ... but your beautiful post is making me need dessert. Or at least an apple. What a great festival. Thank you for the tour and for hosting MM -- Happy Halloween and happy November! 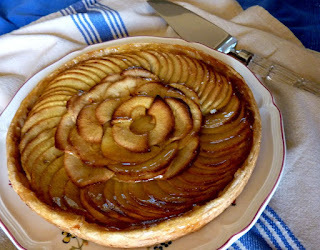 When I think of France & apples the delicious Tarte tatin comes to my mind! What a lovely post - wishing you a good start to November! What a wonderful festival to attend, Maggie! 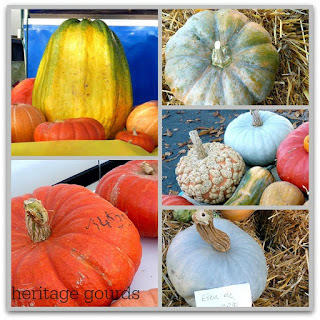 Both to see the beautiful apples and other fruits and gourds and foods, and to tastes and buy special products. Happy Mosaic Monday! That looks like a wonderful outing - and wonderful food. I don't know if I could have resisted the scallops though. Washington State grows a lot of apples - in fact they are famous all over the country - and we get to enjoy them year round - from grocery stores that carry local apples to farm stores with great mountains of apples - and even can go to pick-your-own orchards. What fun to fill baskets with apples on bright autumn days - and then bake and cook with the apples. What fun! When I was growing up in New Mexico, we would pack a picnic lunch and drive out to Dixon Farms for apples. It was a beautiful spot in a lovely valley. They grew different varieties and made cider -- the best apple cider I've ever had. Thanks for the memories and thanks for hosting! Happy Monday! What a wonderful festival of apples. The weather looked quite nice for strolling around and visiting the stalls. That Tart Tatin looks like art work. Love the shot of the little master in training. Have a good week! What a wonderful festival! It looks like great fun and very tasty too I am sure! Thank you for hosting. Happy Monday! A Fete de la Pomme sounds like a wonderful way to celebrate this favorite and versatile fruit. The French know how to do it well! What a delicious looking tarte tatin - I've eaten my chopped apple with yogurt and nuts for breakfast, but could do with a slice of that tarte for afters! Oh delicious! I love the fresh produce to be found in country markets. I'd love that tarte tartin please. Have a fabulous week. What a delightful post! The market sounds like it was such fun. That tart looks delicious! Thank you Maggie for hosting Mosaic Monday 14. 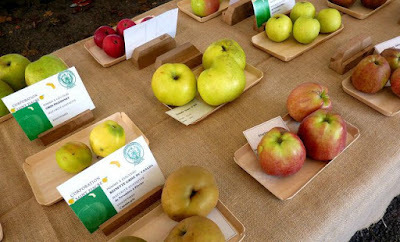 I enjoyed the peeks into The Festival of Apples market. 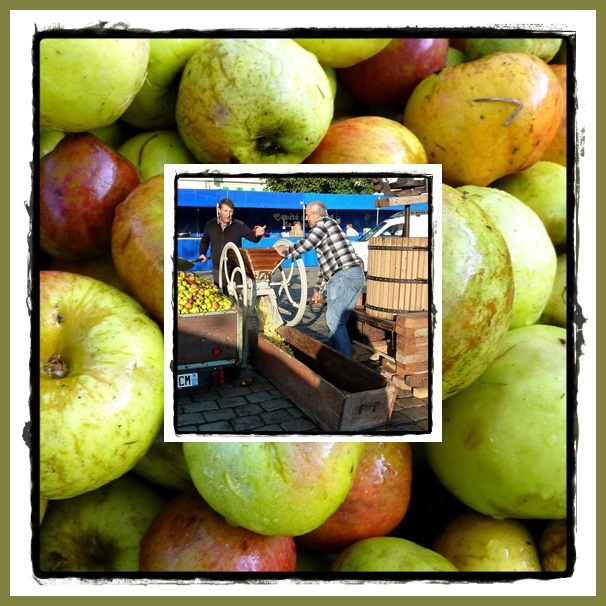 How I would LOVE to come to your apple fest. The tarte Tatin looks gorgeous and I love Calvados. Oh, yum! What a fantastic way to spend some time with locals. I can just imagine the taste of the yummy fruits! I did have a mosaic but was late posting.. Have a great day..! Bon Appétit indeed. 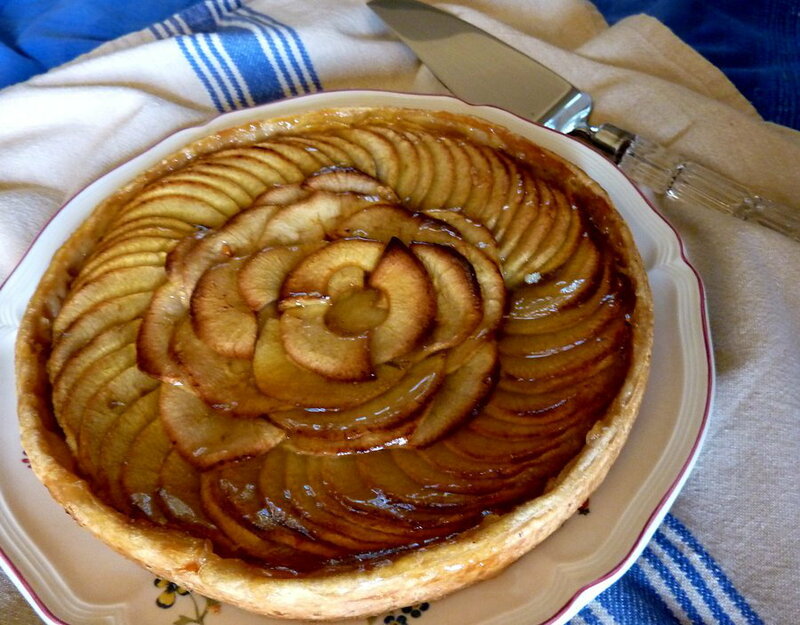 The apple tart looks delicious and too perfect to eat. 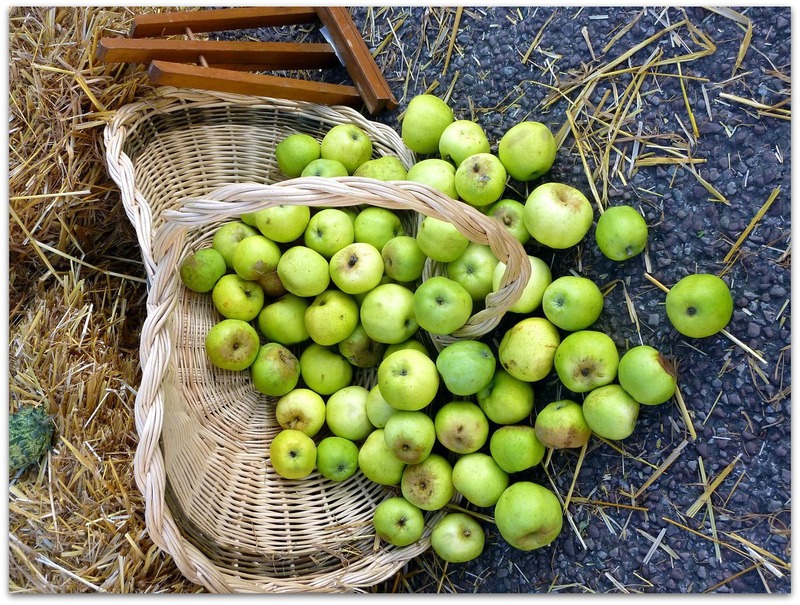 We had our own sort of apple festival of one here as we picked our own apples. They have been so good. Store apples certainly do not compare, do they?